What if someone found sound historical proofs from Jesus’ lost years that revealed two shocking revelations about Jesus’ life? What if conservatives considered one revelation to be blasphemous, and liberals counted the other as mythological? 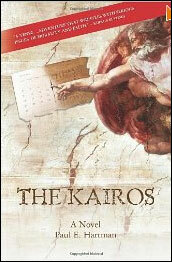 Paul Hartman, in his new religious thriller, The Kairos—a term that signifies a point when God breaks into human history—deftly answers those questions. You don’t want to miss the ramifications found in this book. When Hartman’s protagonist, Dr. Lute Jonson, a world-class archeologist and Dead Sea Scroll scholar, decides to unveil to the world these heretofore hidden proofs (scroll fragments accurately carbon-dated to the early first century), all hell breaks loose. Jonson inadvertently puts himself, his family, and friends in grave danger as powerful fundamentalist religious and secular forces (where else could you find Vatican officials and CIA agents working together?) race to stop him before he reaches a international media outlet. You won’t be disappointed with the book’s global intrigue that takes you from Jerusalem to northern Alaska, or its heart-stopping twists and turns, or an ending that’s anything but predictable. What’s at stake, according to some, is the faith of a billion Christians worldwide. But the message in Hartman’s fictional account of what could be, goes beyond what the book’s characters think to the heart of Jesus’ message: follow the way of love, not historically-bound law, and embrace this love that drives out fear. Moreover, it goes to the heart of how we read the Bible. This engaging book reveals both a Jesus we never knew and one we always did, while reminding us to embrace the marginalized of our day.